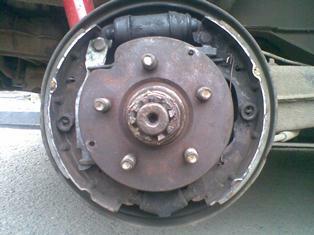 Brakes are perhaps the most important part of a vehicle. You want to know that you are able to stop when you want to! Ever since I bought the van the brakes have never been sharp. While I was replacing my rear brake shoes I realised that one of the cylinders was leaking and it was definitely the cause for my poor brakes and the constantly deteriorating level of brake fluid. So before I launch into the procedure I should probably expalin how brakes work. The only part of the braking system most people know is the pedal! Well just past the pedal is a system of brake fluid that transmits the force you apply on the pedal onto the brakes. 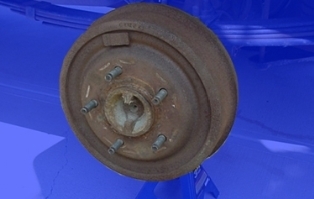 When the fluid gets to the wheels, it compresses brake pads (in the case of disc brakes) while it expands brake shoes (in the case of drum brakes). What is the difference? Look at my borrowed picture from the internet. 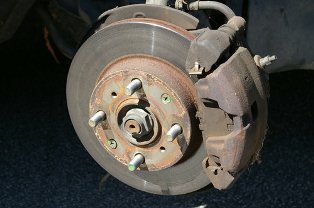 Disc brakes are usually found in the front wheels of most modern vehicles while drum brakes are usually found on the rear wheels. Disc brakes are far more effective because they are able to dissipate heat (a by product of the force applied to stop a vehicle) faster than drum brakes. High end vehicles and performance vehicles usually have disc brakes on the front and rear but their rear brakes also have a secondary braking system involving drum brakes. This is usually for the parking brake (hand brake). What is a bad cylinder? So in the case of my van, one of my rear drums had a cylinder leaking. The cylinder helps in expanding the brake shoes. A leaking cylinder means that the fluid does not expand the brakes to the best of its capability. See the diagram below and note how the leaking fluid had accumulated dirt and the area around it was wet. It should always be bone dry. Put in the new cylinder and replace the brake fluid line and then the 13mm bolt to hold it well onto the system. You need patience here. You do not want to damage the threads on the new cylinder. Fill the entire braking system with brake fluid and bleed the brakes. 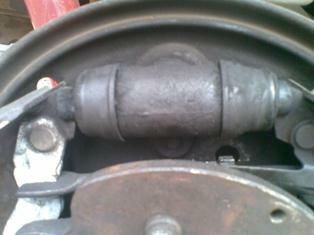 This link probably has better pictures and more detail on how to remove the brake shoes. But in my defence my hands were so dirty I could not do proper pictures!